Doxie Mel Designs: Jaded Blossom's April Sneak Peek Day Four :: Cherry Blossoms! Jaded Blossom's April Sneak Peek Day Four :: Cherry Blossoms! Hello Everyone! 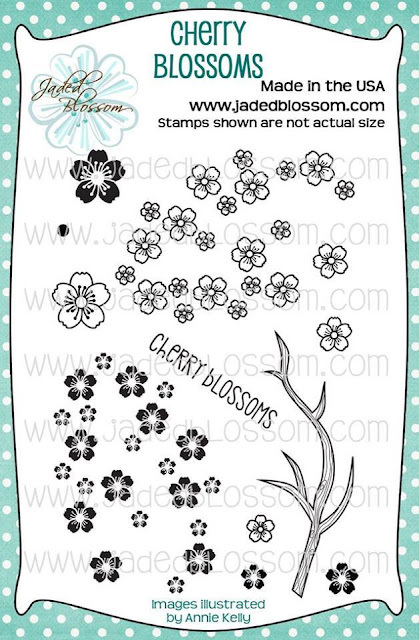 Today is the fourth day of stamp previews for Jaded Blossom's April Release. We have a new stamp set called Cherry Blossoms. Here is a treat box I decorated with the new stamps. This is a really fun set to play with! I stamped Cherry Blossom's on the kimono and on the background for the sentiment. The sentiment is from another new stamp set, Love and Kindness. I filled the clear gable box with Green Tea Mochi, The girl is a new file from SVG Cutting Files, Chibi Geisha Girl. This is adorable! LOVE the stamped cherry blossoms on her dress! this is sooo pretty love that u used it as a background ! Go Lakers! ..well better luck next year.